Would you like to crochet a Buddha statue but don't know where to begin? There are a handful of great, unique Buddha crochet patterns. Some of these are free Buddha crochet patterns while others are affordable alternatives. Each one is unique from the others so this roundup shows you the diversity of different designs available to you. Explore these patterns; after working from several of them you'll probably have some ideas for creating your own! Why Crochet a Buddha Doll? There are so many reasons that you might want to make a crochet Buddha doll. The Buddha may be an important part of your religious or spiritual practice and therefore something that you want to honor. As a practitioner, you may want to include a Buddha in your altar, shrine or just somewhere in your space as a touchstone to remind you to engage in your practice. You may also choose to gift Buddha crochet dolls to people who have been important in your spiritual education. Of course, you don't have to be a Buddhist to want a Buddha doll. In fact, many people who aren't practitioners but who believe in some of the basic philosophies of the practice find that they are reminded of these values by the presence of a symbol such as one of these dolls. You may know others in your life who would also appreciate this kind of sacred reminder. And of course dolls of all kinds, including these crochet dolls, can be special for children. These crochet patterns will show you a number of different ways that you can make a Buddha using crochet. The majority of these crochet patterns are for amigurumi stuffed dolls, which are all made in the same basic single crochet style (although with variations in design). Although not depicted here, you could also crochet a flat appliqué in the style of Buddhist design. Likewise a filet crochet pattern or other graph-based pattern would be a terrific starting point for crocheting Buddha on a blanket or for a flat wall hanging display. What you will see as you explore these nine crochet Buddha patterns is that the little details make all of the difference when it comes to creating the design that you want. Consider the size of the doll that you are seeking to make, which may be determined by when and where you want to use it. Think about how much assembly you are willing to put into the doll; some of them are made nearly top to bottom while others are made in many different pieces that are then stitched together. Decide whether you want the face and head to have a lot of detail or to remain relatively simple. By answering these questions, it will easily become clear to you which style of Buddha doll is the right one for you to crochet at any given time. This is the simple, straightforward Buddha doll design that many people have in mind when first seeking a Buddha crochet pattern, and it is a really great place to begin. This free crochet pattern comes from amigurumi designer Philae Artes. This is a basic amigurumi doll that uses single crochet and double crochet stitches. The pattern includes photos for each major step of the process as well as written English instructions for the entire project. Each piece of the project is worked separately: head, body, legs, ears, and arms. These pieces are then assembled. The eyes are made from felt and adhered on. The finished doll measures about 5 inches when crocheted to the specifications of the pattern. There is an additional part of the crochet pattern for the cloak that can be draped around the arms of the finished doll to give it a monk-like appearance. This is optional but sets the style of the doll. 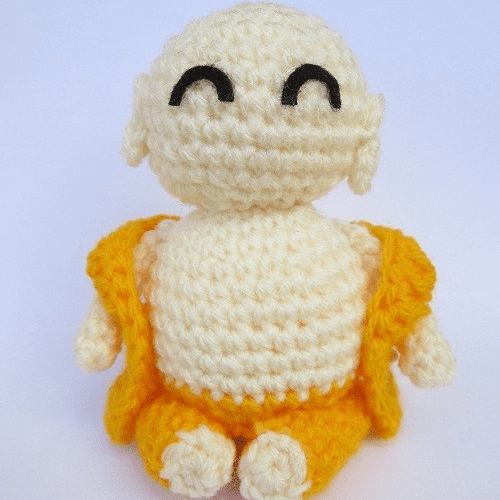 This is a pattern for a laughing Buddha-inspired crochet monk. He is clothed in the robes of a monk and sports a big belly and an embroidered smile. This crochet pattern, which is for sale through Ravelry by Millionbells, uses basic crochet stitches including single crochet and half double crochet. There is also a bobble stitch, with instructions for that special stitch included in the pattern. The pattern is worked both in rows and in the round. If worked as written, the finished amigurumi Buddha doll should measure about 9" tall. The designer notes that of course you could make it smaller or larger by simply changing your hook and / or yarn size. In addition to being available on Ravelry, this pattern is for sale through Craftsy and Etsy. Just look for Millionbells on either of those sites. Although Millionbells is a Netherlands-based crochet designer, the pattern itself is available in English. This Buddha crochet pattern is another simple amigurumi pattern. What sets it apart is that the robes are worked directly into the design of the pattern, rather than added as separate accessories. The arms are folded in beneath the robes, which increases the uniqueness of this piece. AlaSascha designed this Buddha crochet pattern to be easily worked in two different sizes. The large size (a little over 7" tall) is worked in the same way as the small size (about 3" tall) but uses double-stranded yarn instead of a single strand. The smaller size is perfect for little shrines or as a desktop reminder of Buddhist principles. The pattern, which is available for sale through Etsy, also includes instructions for resizing. This pattern comes from Designs by Mamta who explains that the design represents a baby version of the Buddha. The maker explains that the pattern was made in "devotion to The Great Enlightened Master", sharing more about the meaning of the piece on the pattern's home page. This crochet pattern, when worked in Aran weight yarn with the recommended hook size, is approximately 6" tall. This is intended to be a serene, peaceful doll. One of the most unique features of this crochet pattern, as compared to the others, is the style of the hair on Baby Buddha. This Buddha pattern, created by Shannon Murphree, is available online through the Wayback Machine. It is worked in single crochet and double crochet stitches, utilizing basic amigurumi techniques. The entire head and body are worked together. The five-round base and the simple crochet ears are worked separately and joined afterwards. The details of the face are added with embroidery. When worked as described by the designer, the doll measures about 7" tall. This pattern is for a small Buddha crochet doll that measures only about 3" tall when worked as designed. It is an amigurumi pattern that is seated against a background worked in standard crochet. The addition of a pearl bead makes this design stand out from the others (although of course you could choose to add such a bead to any of the designs if so inspired). This crochet pattern is for sale on Ravelry by designer Sabrina Boscolo. This crochet pattern is set apart from the others in that it is not a design for an entire Buddha doll but rather just the statue head. As such, the head is much more detailed than the heads of the other designs. The hair is particularly unique and interesting, and the textured stitches that make it up go all the around the head. This is definitely a three-dimensional design intended to be looked at from all angles. The embroidery on the face also has great attention to detail. When worked as described in the crochet pattern, which is available from CalocaCrochet on Etsy, measures about 8" tall. This is the tallest of the Buddha crochet patterns rounded up here. Measuring about 18", it is more like a classic stuffed doll than an amigurumi pattern. As pictured, it can hold a small candle, making it a great option for someone seeking a doll to assist in meditation but also perfect for someone interested in decorating with their crochet Buddha. And because it is so much like a stuffed doll, it is a good choice for a pattern for a child's toy as well. This versatile design is for sale from HandmadePatronen on Etsy.